10507 Edgewater Rd Louisville KY 40223 is a fantastic four bedroom home in Plainview. The landscaped yard and pleasant front porch lead into an open foyer with hardwood flooring. Hardwood continues throughout the Family Room, Living Room, and Formal Dining Room. The Living Room and Formal Dining Room contain crown molding and the Formal Dining Room displays a nice chandelier fixture. You'll love the pretty tiled kitchen with plentiful cabinetry, a good sized dining area, and stainless appliances! The Family Room is a warm gathering space with built in book cases and a brick fireplace with raised hearth. A laundry room and half bath are also positioned on the first floor. The spacious Master Bedroom showcases a huge walk-in closet, neutral decor, and vaulted ceiling. In the Master Bath you'll find a walk in shower, double vanity, and jacuzzi tub. Both other second floor bedrooms are large and positioned close to a Full Bath. The Basement Level of the home contains a wonderful Family Room with enough room for a living area as well as a recreation space. A Full Bath and another completed room currently used as an office are also in the basement. The backyard is a great spot for outdoor entertaining and games with a partial wood privacy fence and patio. 10507 Edgewater Rd Louisville KY 40223 is in an outstanding location, spotless throughout, and move in ready! The home received new carpet in the entire upper floor, along both stairways, and in the basement in 2010. A new water heater was installed in 2012. Plainview is a terrific neighborhood in Louisville's east end and provides residents with a tennis court, pool, and playground! To learn more about this property or homes in Plainview, contact one of our highly qualified Realtors in Louisville KY today! At Home In Louisville Real Estate Group will be hosting an Open House at 8437 Arbor Meadow Way this Sunday March 24th from 2-4pm! Come out and view this wonderful stand alone patio home with spotless interior. The property includes 2 Bedrooms, 3 Baths, and a two car attached garage! For information about other Open Houses in Louisville KY contact our team of qualified Louisville KY Realtors today! 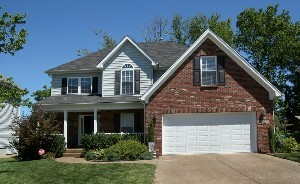 2004 Fandango Ct Louisville Ky 40245 is a gorgeous home in the desirable Polo Fields neighborhood! The house is immaculate and welcomes guests with a landscaped front yard, columned entry, and three car side entry garage. Sparkling hardwood floors and custom finishes provide elegance throughout the first floor. The eye catching foyer is two stories and opens to a Formal Dining Room accented by crown molding, decorative chandelier, and wainscotting. A stunning "wall of windows" is the highlight of the Great Room and overlooks the back yard. The Great Room also showcases a lovely fireplace surrounded by built in book cases. The gourmet Kitchen includes a breakfast bar between the kitchen and great room, kitchen island, stainless sink, granite counter tops, and custom cabinetry. A private office with executive wood paneled walls and a nice half bath complete the first floor. Two stairways access the second floor of the home (a front stairway in the foyer and a back stairway from the kitchen). The Master Suite displays recessed lighting and a tray ceiling. The Master Bath is spa like with a jacuzzi tub, walk in shower, and two vanity areas. The three other second floor bedrooms are spacious. One bedroom has a private Full Bath and the other two are connected by a Jack and Jill Bath. The Laundry room is also located conveniently on the second floor. The finished walk out basement showcases a large Family Room with an additional fireplace and recessed lighting. Another Full Bath and one other room complete the basement. The spare room in the basement would be the perfect spot for a play room or additional bedroom! 2004 Fandango Ct Louisville Ky 40245 is truly exceptional inside and out. The outdoor area of the home is inviting with a large back deck and patio space as well as an attractive yard. Residents of Polo Fields will also enjoy the use of a golf course, private clubhouse, tennis court, pool, and playground. Contact one of our qualified Realtors in Louisville KY today to set up a private showing of this beautiful home. 8437 Arbor Meadow Way, Louisville, KY 40228 is a fantastic move in ready stand alone patio home in Arbor Creek! The property includes a two car attached garage and has been exceptionally maintained. The Living Room is cheery with lots of natural light and opens to the Kitchen Dining Area which exits to the back patio. The Kitchen features black appliances and plentiful cabinetry. A nice half bath completes the first floor. Upstairs you'll find a wonderful loft space that could easily serve as an office or playroom and two large bedrooms. The Master Bedroom has a huge walk in closet and a private Master Bath. There is also another Full Bath close to the other bedroom as well as a convenient second floor Laundry Room! 8437 Arbor Meadow Way, Louisville, KY offers all of the joys of home ownership without the time and stress associated with home maintenance. Snow removal, grounds keeping, exterior maintenance, and trash pick up are all included for Arbor Creek residents. You'll love the pleasant front porch and nice back yard and patio space! Give us a call to set up a private showing of this property or for additional information about Louisville Real Estate. Join At Home In Louisville Real Estate Group for an Open House this Sunday at 3354 Newburg Rd Louisville Ky! The property includes four bedrooms and sparkling hardwood flooring throughout much of the home! The lot is inviting with mature trees and a two car detached garage. Browse the site to view more Open Houses in Louisville KY, or contact our team to set up your private showing! 4817 Napa Ridge Way Louisville KY 40299 is a fantastic home in Silver Oaks with 3 Bedrooms, an inviting front porch, and a lush backyard that backs up to Charlie Vettiner Golf Course! The home also features hardwood floors that flow through the Foyer, Dining Room, Kitchen, and Great Room. 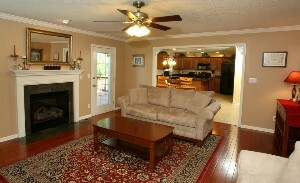 The Great Room showcases a wonderful fireplace with tile surround and is detailed with crown molding. 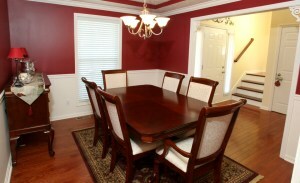 Crown molding also accents the Formal Dining Room along with a tray ceiling, and decorative chair rail. The home is great for entertaining and includes a large kitchen with a separate dining area, island and breakfast bar, plentiful cabinet space, and black appliances. A walk-in Laundry is also positioned on the first floor. The Master Bedroom is spacious with a private Master Bath containing a jacuzzi tub, walk-in closet, and shower. Both secondary bedrooms are good sized. One contains a vaulted ceiling and the other has an attractive built in shelving and desk unit (perfect for an office or homework space). The basement level is partially finished with a nice family room. 4817 Napa Ridge Way has a quiet back yard with mature trees, a lovely deck, and a custom built stone patio and fire pit! The current owners have made numerous updates to the interior and it shows! The home is welcoming and move-in ready! For more information about this home or to schedule a showing, contact At Home In Louisville Real Estate Group today!